We never get tired of repeating that renovation and regeneration remain particularly interesting projects because they force the architect to grapple with the surroundings and show how skilled they are at getting around certain restrictions. So when the architect involved is Jesús Aparicio, one of the greats of Spanish architecture, whose career is full of combinations of reflection with teaching and construction, you can rest assured that you will end up with a truly remarkable result. 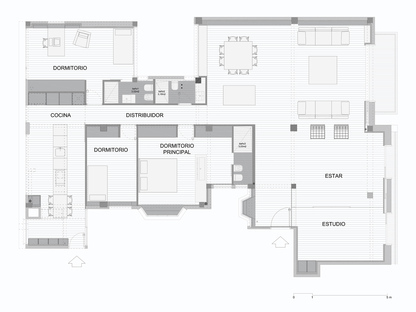 After studying the floor plan of the existing apartment, Aparicio decided to accentuate its division into two main areas: service areas and served areas. The rear of the home takes advantage of the lighting and ventilation of the building's internal patios, and there he positioned the service areas comprising the bedrooms, bathroom, and large kitchen. The kitchen is particularly bright thanks to a large old skylight that the architect skilfully used to his advantage. The open, public part, i.e. the “served area” of the house, stretches along the main facade of the building. This is a large open space that appears to be partitioned by the environment itself. The real eye-catcher is here, skilfully set up by Jesús Aparicio thanks to large windows that not only open onto the balcony but also frame the truly unique view from the house. The reason being that this area faces onto the most important art gallery in Madrid since the 18th century, the Prado, and this is what gives the project its name, a house between a museum and a kitchen. Aparicio's intervention has succeeded in heightening the many already existing positives of the apartment: the large main space, the substantial ceiling height and the reinforced concrete structure whose beams and columns have been exposed where possible, communicating with the white plastered walls and some bare brick walls. Interiors that are strikingly reminiscent of an art gallery, an impression further underscored by the choice of white oak flooring throughout the house, bringing everything together and overcoming the division of the area.